The following information is for the average adult and these numbers can change if you are an elite athlete or training very intensively! Always consult with your doctor and Canada's Food Guide before making changes to your diet. First, always try to get your protein sources via macronutrients (meats, soy milk, dairy, etc...) and then if your diet does not support sufficient protein amounts, add in a whey or soy protein isolate such as Promasil. Second, regardless of where you live, how you live or what kind of job you do you NEED .8 grams of protein per kg of body mass. Now, your probably thinking, "AAAHHHHH, WHAT DO THESE NUMBERS MEAN??" To break it down for you if you weigh 60 kgs ( 132lbs) you NEED at least 48 grams of protein from something in the run of your day. Now, if you are pregnant that number per kg is higher (~1.1 per kg) and if you are working out or exercising intensively, your intake per kg should increase to ~1 gram to 1.2 grams/kg. Now, you are probably asking yourself, "Ryan, what happens if I consume too much protein in the run of a day?" Well, you ask a good question. Too much protein above what your body needs becomes stored as energy in the form of fat mass (just like consuming too many calories, carbs, fats, etc...). Therefore, your own window of protein intake depends on your own weight and your activity level. 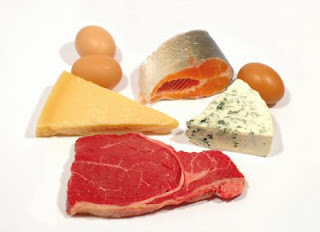 If you happen to consume too much protein you will often notice weight gain as fat mass and now you know why that happens. If I were you, I would keep track of your protein intake and pay close attention too it. Protein fuels your body's muscular system and your body needs it just like carbs, fats, cals, etc...But, just like everything else which leads us to wellness, it must be balanced. We have to constantly balance our daily protein intake and try hard to meet our own requirements.